April 20 - Local human-rights activists are launching a billboard campaign as part of a continuing effort to expose the misuse of U.S.
April 20 - Local human-rights activists are launching a billboard campaign as part of a continuing effort to expose the misuse of U.S. taxpayer money to support Israel’s ongoing discrimination against the Palestinian people. 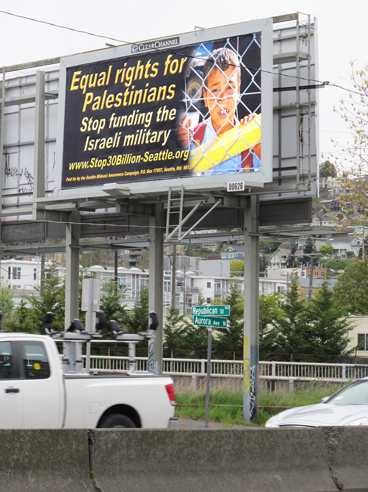 Seattle Mideast Awareness Campaign (SeaMAC) will put up several billboards in Seattle with the slogan “EQUAL RIGHTS FOR PALESTINIANS ­ Stop Funding the Israeli Military.” The first two billboards will go up on Elliott Ave West, just north of West Lee St, and on Lake City Way NE, just south of NE 104th St. The billboards follow SeaMAC’s Metro bus ad campaign launched last December: “ISRAELI WAR CRIMES: Your Tax Dollars At Work,” which was first approved, accepted and printed, then suddenly cancelled by King County. With legal representation by the ACLU, SeaMAC has filed a lawsuit against King County for violating SeaMAC’s constitutional rights by refusing to honor a contract to run the ads. Israel controls the lives of over five million Palestinians, most of whom have neither voting rights, political rights or civil rights. Israel has separate sets of laws, rights and opportunities for people of different ethnic groups. Palestinians in the Occupied Territories are denied basic civil and political rights. Palestinians living inside Israel are subject to segregation and discrimination, with central provisions of Israel’s Basic Law explicitly denying equal status to non-Jews. The US gives several billion dollars of military aid to Israel each year, and has promised $30 billion of aid over the next ten years. Israel recently asked for $20 billion more aid. A vigil and protest at Westlake Plaza will be held on Sunday May 15, from 12:00 to 5:00 pm. A theatrical display of over 100 small tents inscribed with the names of destroyed Palestinian villages will commemorate and protest the events of 1948, when two-thirds of the indigenous Palestinian people were forcibly displaced and over 400 Palestinian villages were destroyed. The new state of Israel created laws to prevent the return of those Palestinians after the war, and now Palestinians are one of the largest and longest-suffering refugee populations in the world. To describe these events, Palestinians use the word “Nakba” which means “catastrophe.” Today, Palestinians continue to be driven off their land to make room for illegal Israeli settlements. The May 15 Nakba event is co-organized by Palestine Solidarity Committee, Voices of Palestine, and Seattle Mideast Awareness Campaign.